This is a Learning Target Tracker for 2 digit X 2 digit multiplication aligned with 4th grade math common core standards. 3.1 I can use place value and estimation to multiply by tens. 3.3 I can use area models and partial products to multiply 2-digit numbers. 3.4 I can use place value and partial products to multiply 2-digit numbers. Once you download the file, it will ask you to copy and paste a link into your browser. This link will force you to make a copy into your Google Drive. 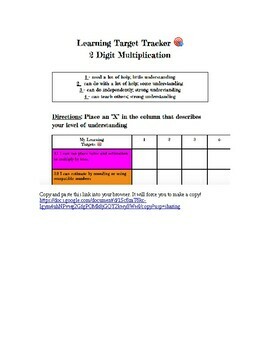 Please see my store for other learning target trackers related to place value and other 4th grade math content! THANK YOU!